Music Made in Heaven, along with a massed assembly of handbell ringers, will ring the National Anthem for the 2017 Triple-A National Champion Durham Bulls. We will ring 10-15 minutes before the first pitch. Patients, visitors and staff traveling the concourse between Duke Hospital and Duke Medicine Pavilion will hear MMIH ringing as part of the 2018 Spring & Summer Lunchtime Concert series. presented by Music Made in Heaven celebrating the memory of the children for whom the bells have been donated. A reception will follow the concert, all are welcome. 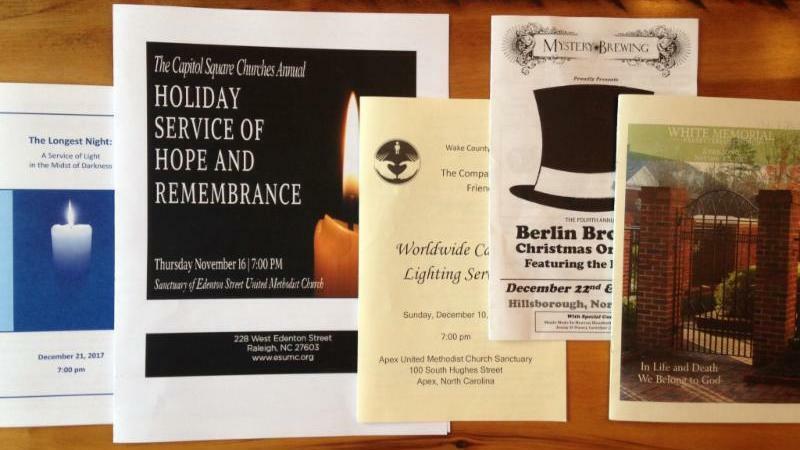 As 2017 came to a close we concluded a busy November & December playing in a wide range of venues, many familiar ( read Ringing Holiday Favorites) as well as in some new, non-traditional, venues for bell ringing ( read Mystery Brewing Company Connection). Now you will find us rehearsing new music for The Gathering and brushing up on the National Anthem for the massed ringing at the Durham Bulls baseball game. We recently attended the Lowcountry Handbell Workshop which provided the opportunity to expand our skills as handbell ringers and to introduce Music Made in Heaven to a new audience ( read Music Made in Heaven Attends Lowcountry Handbell Workshop). These talented ringers filled in for us at rehearsals and/or performances during November & December 2017 (often on short notice) whenever MMIH had an open position due to illness, vacation schedules and job or family commitments. Handbell ringing is a group effort and we are at our best when we have all thirteen positions filled at the handbell tables. Thank you for stepping up to the table! Music Made in Heaven is looking for a few new ringers for our Fall 2018 season! 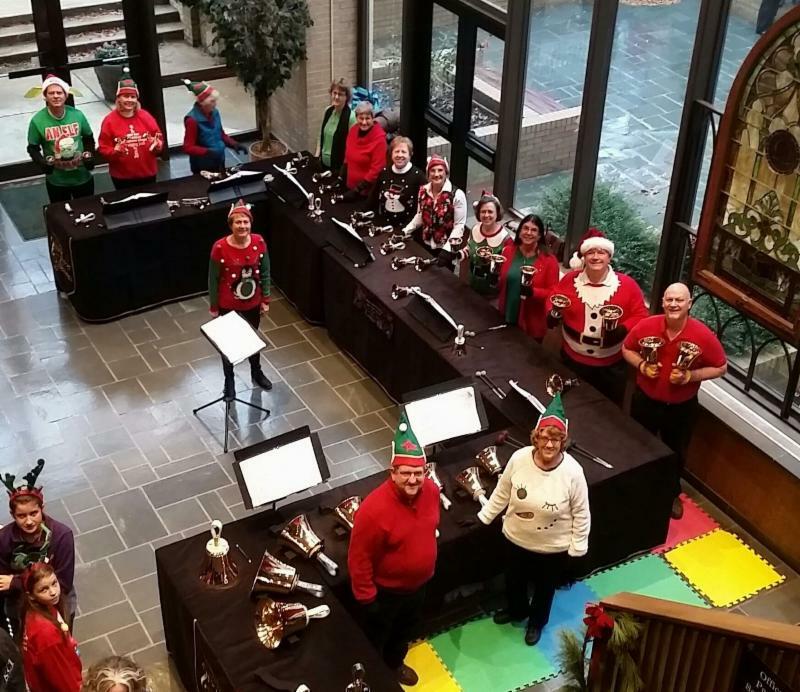 On December 9, Music Made in Heaven handbell ringers played a beautiful selection of Christmas music as the backdrop for the annual Toy Joy event coordinated by the First Baptist Church of Raleigh, Salisbury Street. Families in need are invited through the FBC Clothing Ministry to come and select Christmas gifts and stockings for their children. This past December, toys and gifts were distributed to about 250 families representing over 900 children. Over 150 volunteers gave of their time to serve this invited group of families. Wearing “Elf hats” and holiday sweaters, the ringers helped to provide a warm welcome to all, even on a cold, snowy morning. The following Wednesday, December 13, Duke Hospital staff, patients and their families walking (or being transported) through the concourse between Duke Hospital and the Duke Medicine Pavilion between 11:AM and 1:00 PM, were drawn once again to the sounds of familiar Christmas Carols from “Jingle Bells” to “We Three Kings.” As they paused, they had a close up experience of us ringing with our tables set up against the wall of glass in the hallway now referred to as the Arts and Health Galleries . MMIH is now among a group of Performing Artists that includes community and Duke University musicians and is coordinated enthusiastically by William Dawson, the “Artist-in-Residence” as part of the extensive Arts & Health at Duke program. MMIH first began ringing at Duke more than five years ago to children in the Pediatric Intensive Care Unit during the Christmas season. A few years ago, we were directed to William, who invited us to become part of his Performing Artists program. At his request, we now play twice a year, at Christmas and in the spring. We look forward to continuing these cherished holiday traditions. 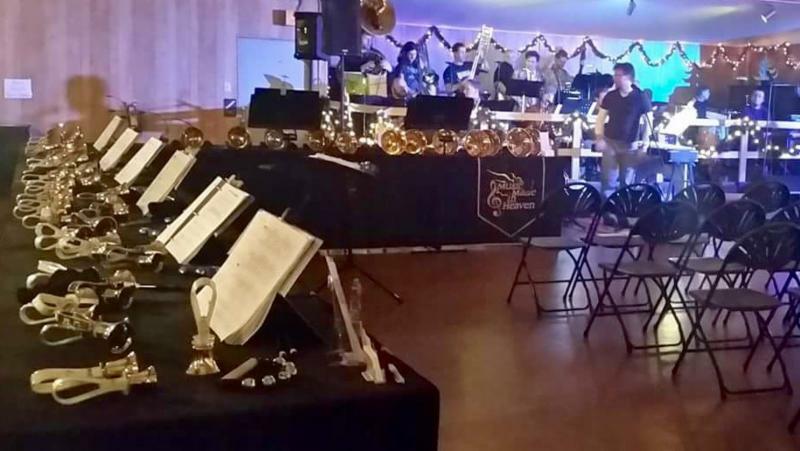 On Friday, December 22, 2017, Music Made in Heaven joined the Berlin Brothers Christmas Orchestra in a concert held at the Big Barn Community Center in Hillsborough, NC. The original venue, Mystery Brewing Company, turned out to be too small for the number of concertgoers expected, so the concert was moved at the last minute to the community center. William Dawson, Artist in Residence at Duke Hospital, leads the Berlin Brothers Orchestra, which includes several people who also work at Duke Hospital. William happens to be one of the most fervent fans of MMIH, and he invited us to play as the opening act for all three concerts given that weekend, but we were only able to participate in the Friday night concert. MMIH played our Christmas repertoire, adding jingle bells and inviting the audience to participate when appropriate. The concert was festive and full of energy, and MMIH has been invited to return next Christmas. Mark your calendars now for the weekend before Christmas and come out to see us! Kevin McChesney, our clinician and a prolific composer and arranger of handbell music, made that comment to one of our Music Made In Heaven members as we were preparing for our dress rehearsal for the concert that was the culmination of our wonderful weekend of handbells. Ten members of our group, plus our fearless director, Barbara Marley, traveled to North Charleston, SC, to learn from Mr. McChesney and the members of “Palmetto Bronze”, a community handbell choir. We polished four pieces we had prepared in advance: “A River Runs Through”, “Gabriel’s Oboe”, “Cantad al Senor”, and “Timbrel and Dance”. In addition to preparing those pieces, we took part in two classes each that were taught by the members of the Palmetto Bronze. 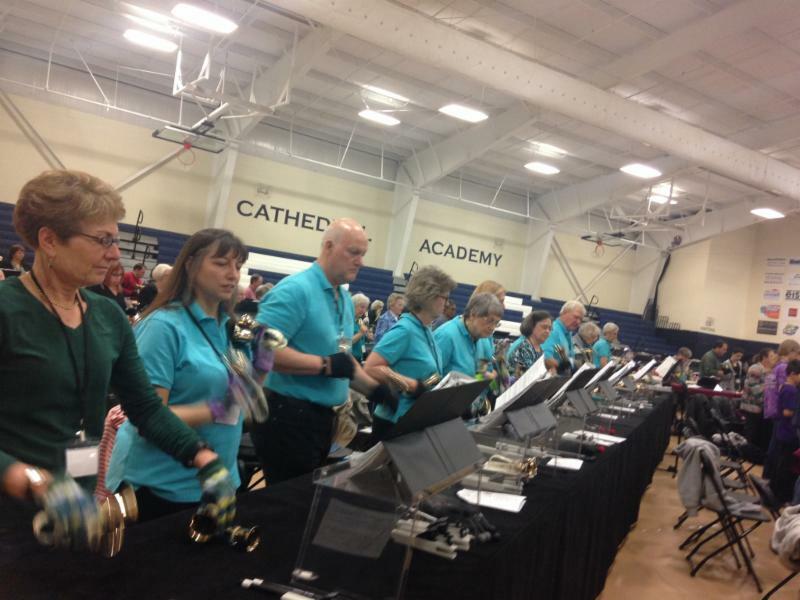 The classes covered handbell techniques such as Four-In-Hand ringing, weaving, rhythm, sight reading, and more. Our final concert was very much appreciated by the crowd who came out to hear it, but the members of Music Made in Heaven will tell you that the best part of all was the time for fellowship and deepening our relationships with one another. We are truly a family that supports one another and celebrates all of the children represented by our bells. Indeed, we know our group is special. 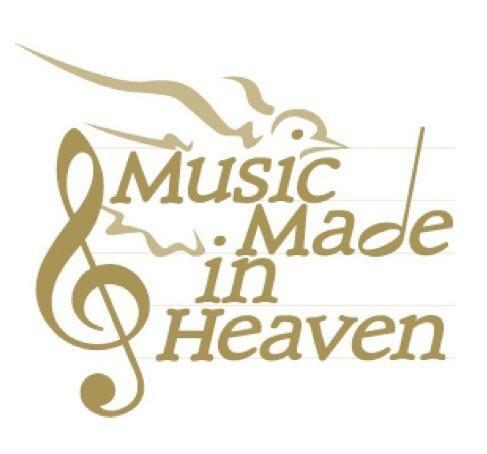 "I recently donated my car to Music Made in Heaven through Donation Line, LLC . After designating MMIH as the recipient, I was given the information on the process and instructions on how to proceed. When the car was ready to be picked up, the pickup agency contacted me for directions to the car and to set up the pickup date. I didn't even have to be present! When the vehicle was auctioned, the information was passed to MMIH, from whom I receive a donation statement for my tax return. In as little as two phone calls, it was a completed deal; it can't be simpler than that to donate to such a worthwhile cause." This donation brought a gift of $682! What do you have that you'd like to donate: car, truck, boat, camper, jet skis? We greatly appreciate all financial contributions as they help with the insurance on the bells, the purchase of auxiliary equipment, travel and performance related expenses, advertising, printing and communication costs as well as upkeep to our website.